Linework style, which has gained great popularity over the past five years, will be perfect for those who are not interested in traditional pictures and are bored with the usual scenes with animals and flowers. 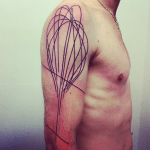 The presence of straight lines comprising the picture is the main feature of the image of a tattoo in the linework style. This direction in the art of tattoos is distinguished by the severity of the lines, as well as the clarity of the image. Linework tattoo style was born not so long ago. The word “linework” in English means literally “work with lines”. Tattoo artists sometimes call it “linear technique”. The popularity of this direction of in king images on the body is explained by its novelty. More classical directions start to get a little boring and people want something new. Due to its young age, the style enables each artist to contribute to the image of his elements, which can make the tattoo more original. Linework tattoo style can be inked in different colors on the body, but black and red are used more often than others. Pictures of animals look radically unusual, even being ordinary at first glance. If the tattoo artist has a good imagination, he can make a portrait, fairy-tale characters and anything in this style. One of the main advantages of this direction is the presence of abstraction. Such a picture has a lively appearance and is unlikely to bore a person. Within the framework of this genre, an experienced artist can introduce his own unique artistic technique that will enable him to create a first-class author’s work.